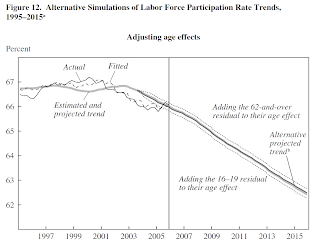 MacroMania: U.S. Labor Force Participation Rate on Trend? Why do so many of the charts I have seen recently show dramatic moves starting around 1971?. Maybe its just me and I am looking for it now now subconsciously'. what would cause LBR to go gangbusters starting around that time? Maybe the inflation that began around then pushed more women in single-income households into the labor force? First, I believe the debate over the LFPR is too absolutist (one side saying it's structural, the other cyclical). Obviously there are a mix of factors. "The bottom line, as I see it, is that the drop in the unemployment rate is not just a smokescreen for a labor market that hasn't really improved since 2008. Relatively few of those who are retired, disabled, or too discouraged to seek a job are likely to return to the labor force. Instead, most of the drop in the unemployment rate in the last few years is a meaningful indicator that the U.S. economy is gradually improving and returning to health." Sure, like with part-time workers (economic vs non-economic), we need to disaggregate those who are not participating in the labor force. 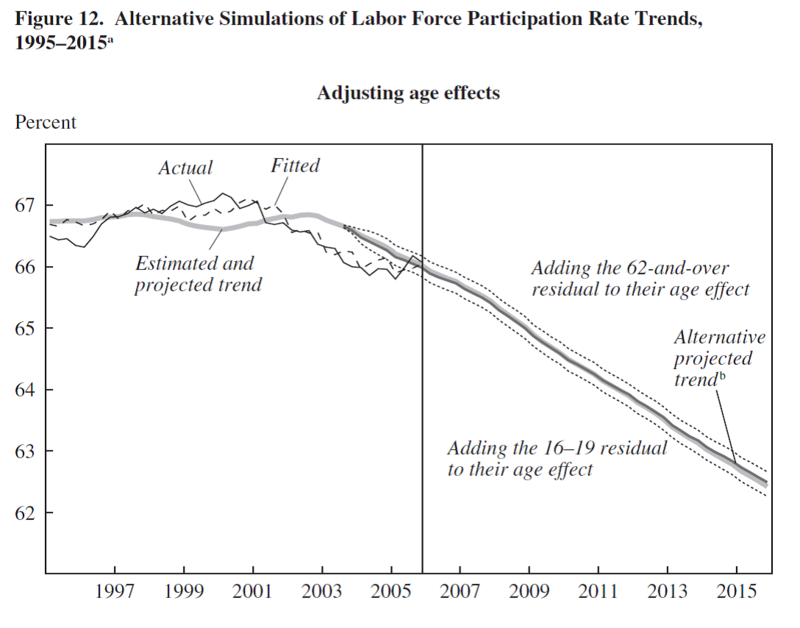 Seniors typically retire, and younger folk are in school, so they pull down the LFPR for the entire labor market. However, the prime working age cohort (25-54) is still experiencing a decline in LFPR (and other labor market indicators), which cannot necessarily be explained away with increased enrollment in school/retirement. Also, the Stephanie Aaraonson, Bruce Fallick, Andrew Figura, Jonathan Pingle, and William Waacher projection is a little confusing. True, their projections were on, but given the huge cyclical downturn in the economy, can we say their forecasting methodology was correct (unless they accurately forecasted the economic downturn)? They were forecasting trends based on (relatively) predictable demographic forces. If you plot actual LPR against their trend, it would have undershot (the recession) but has subsequently moved back to trend.